For our next delve around inside old 8-bit demos in the Code Notes series we’re going to once again drift away from the C64 to instead take a look at something which was released for the Atari 8-bit computers; as with the Amstrad CPC demo your correspondent took a peek at previously, we will need to step away from the 1980s to find something that’s of the same general ilk as the C64 efforts we’ve been perusing, but in this particular case the developers hail from the United Kingdom. The GPS had been reduced to just two members at the point Atari Stars Demo was released in early 1992; Spike was the programmer and handling ripping and graphical manipulations whilst Laurie was inactive due to life commitments but, apparently, still offering moral support – your correspondent has been there himself and is sure that many people in the demo scene can also empathise with that situation! Both members were based in Scotland according to the demo’s scrolling message, with Spike’s postal address being offered up for potential mail trading contacts as was often the case in releases from that era. 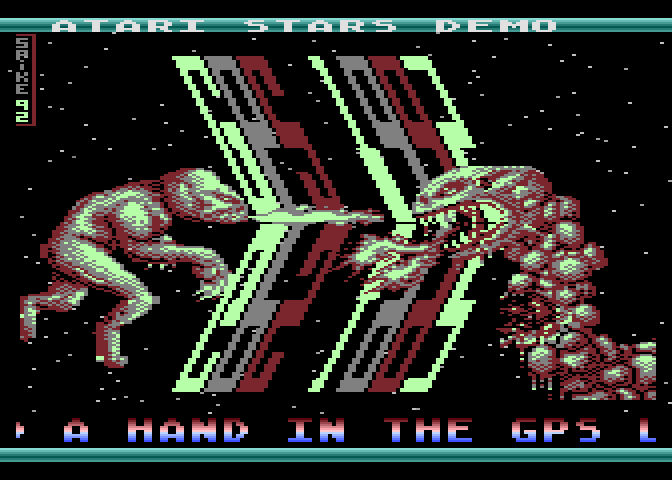 The demo’s main effect is the bitmapped part of the screen which has a player-generated starfield; this is basically built from a couple of hardware sprites (which cover the entire screen height on the Atari 8-bit) and a loop that runs during that main area that writes to their X position registers once per scanline to produce several hundred stars each with independent horizontal movement. The Atari’s hardware can be made to do this easily, but it’s still visually appealing and the parallax effect is achieved simply by having some of the stars move faster than others. Some of those almost ubiquitous Atari 8-bit colour bars are used for the background colour of the title text above the picture and on the character colour for the scrolling message below and there’s no actual moving of data going on for the latter, instead the LMS command in the Atari 8-bit’s display list which governs where that line of text is fetched from in memory is incremented after the hardware fine scrolling completes a character-wide cycle. The music has been ripped from the game Jet Set Willy – the Atari 8-bit version came later than the other 8-bits and, whilst the game itself is considered to be a poor conversion by Atarians and Miner Willy fans alike, it boasts an excellent tune from C64 maestro Rob Hubbard – whilst the two figures in the picture have been extracted from the loading screen of the game Draconus. It’ll be very interesting indeed to see if the author is equally disparaging of these chunks of data being stolen as he was with the music in Planet Invasion on the C64 but, at the time of writing at least, wasn’t as regards the music in Amstrad CPC release HDM Demo 1 – your correspondent assumes that we’ll be treated to a similar level of hypocrisy here. The author’s petty bias aside, your correspondent selected Atari Stars Demo because, despite being relatively simple fare in demo programming terms for an early 1990s release, the various elements have been put together nicely and it has that previously mentioned “fun” factor; it’s very enjoyable to watch the almost hypnotic starfield flying past whilst listening to the music. Your correspondent assumes from a comment in the scrolling message that the S is short for “squad” but the acronym is never fully expanded elsewhere in the demo and there sadly doesn’t appear to be any concrete information about the crew online either. Your correspondent isn’t sure if the Atari version of the game shipped with the picture of if a bedroom developer ported it from the C64 at a later date; Atari 8-bit games on cassette rarely had bitmapped loading pictures presumably because they would have added to some already significant loading times. This entry was posted in Meta Discussion, Programming and tagged Atari 8-bit, Atari Stars Demo, Code Notes, coding, demo, GPS, programming. Bookmark the permalink.